Six Nigerians who has their name in the Guinness World Records. (Photo credit: File Photo). In record breaking Nigerians are not left behind and some have gotten their names into the Guinness World Record with spectacular record breaking action. Olawunmi Treasures BayodeA 40-year-old Nigerian, Bayode Treasure Olawunmi, who few days ago set himself on a reading spree to break the World Guinness Book of Records mark for the “Longest Marathon Reading Aloud” Category has finally done it. The book enthusiast and proud father of three children, logged 120 hours at 3:30 pm today at the YouRead Library Yaba in Lagos, Nigeria. His amazing record outpaced that of his predecessor – Deepak Sharma Bajagain from Nepal, who had 113 hours 15 minutes in 2008. Kafayat Oluwatoyin Shafau (born 30 June 1980), popularly known by her stage name Kaffy, is a Nigerian dancer, choreographer, dance instructor and fitness coach. She is also the founder and owner of Imagneto Dance Company. She is best known for breaking the Guinness World Record for “Longest Dance Party” at the Nokia Silverbird Danceathon in 2006. She broke the world record in longest dance with a time of 52 hours and 3 minutes in 2006. Late Levi Chibuike Ajuonuma’s son, Obi Ajuonuma, popularly known as DJ Obi,has officially broken the Guinness World record for the Longest DJ Set. DJ Obi achieved this feat on Friday, July 1, 2016 at exactly 7:30 am, at the Sao Café, Lekki PhaseI. He reportedly set the record in honour of his father, Levi Ajuonuma, who was a TV producer, before dying in the Dana airplane crash of 2012. His record is yet to be ratified. A Nigerian football, Harrison Chinedu has gotten himself into the Guinness World Records for the ‘farthest distance walked with a ball on the head’. Chinedu on Sunday, March 6 walked from the Redeemed Camp to the National Stadium, Surulere, Lagos where he trekked round the main bowl eleven times to break the record before trekking further eleven times to set a new record. The Cambodia based Nigerian footballer, walked a total distance of 48.04 kilometers in 6 hours, 15 minute to beat the record formerly held by Indian soldier Naib Singh who walked a total distance of 45.64km in his country in 2014. 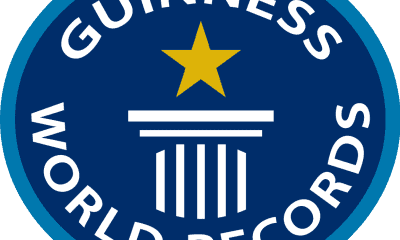 Adetunwase Adenle is reportedly the only Nigeria citizen who has four Guinness world records to his name. The class room teacher and artist holds the record in different categories. He holds the record of the biggest painting that has been painted by the largest number of people and this painting is as big as a football field. It measures about 63.5m (208 ft 3.99 in) x 49.3 m (161 ft 8.94 in) and it was painted by 350 volunteers and this painting represents the map of Nigeria.